The Welsh Highland Railway is now fully restored and connected to the Ffestiniog Railway This two foot narrow gauge railway runs 25 miles from Caernarfon on the Menai Strait in North Wales through the dramatic Snowdonia National Park to Porthmadog. The Millennium Commission, the European Union, the Welsh Assembly and many very generous private donations have raised over £28,000,000 needed to complete the project. Our film will take you on the complete journey and features the powerful South African Garratts. With dramatic cab ride and track side action. See the track gangs at work in the Aberglaslyn Pass and the tunnels, including riding with the works train. See the railway now fully developed working as it is today in 2013. We even used a helicopter to bring you never seen before dramatic aerial views. The helicopter follows Garratt 138 from Castell Cidwn, to cross with 87 at Rhyd Ddu, then down to Beddgelert and breath taking views of the train in the Aberglaslyn pass and beyond Nantmor. 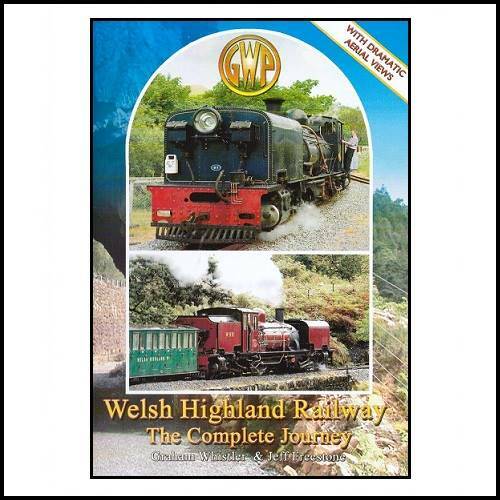 Filmed in high definition and edited by GWP with the full co-operation of the railway. Narrated by BBC’s Nicholas Owen.